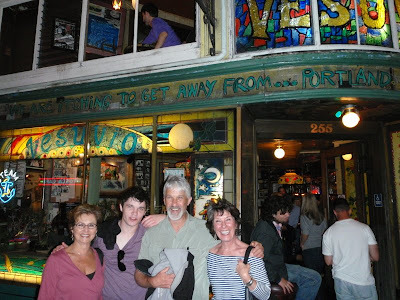 The Vesuvio Cafe is famous as a favored beat hangout in the day. The particularly apropos mantra above the door reads "We are itching to get away from Portland, Oregon." Apparently an obscure reference to a 1915 flea epidemic. And no, we have no idea who these women are. They demanded to be included in this photo. Must be from Portland. 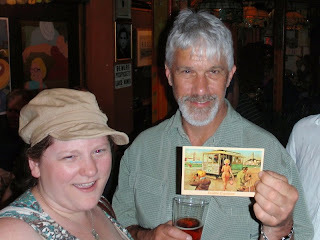 Brent holds a postcard of a famous painting that used to hang behind the bar. Oddly no one working in the establishment knew where the painting was or what is was about. 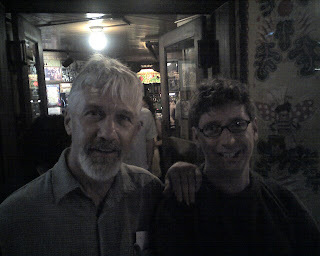 This is the the guy that recommended the La Chouffe at La Trappe. I don't know what he is doing here. I think he is stalking us. FYI, the painting in question is, indeed, hanging on a wall in the bar. As you walk in the door, it's on the facing wall a little to the left.